The following report is part of a series produced by the TRADOC G-2 Intelligence Support Activity (TRISA). While the reports contain no control markings, they are not released publicly. On the night of 11 September 2012, militants attacked the U.S. consulate in Benghazi, Libya using a combination of small arms, heavy weapons, and lethal combustible materials. The U.S. Ambassador to Libya, Christopher Stevens, and three other Americans died as a result of the attack. Accounts vary regarding the adequacy of measures taken by the Department of State, the CIA, and other agencies to prevent this type of incident. The loss of American life speaks for itself as an indicator that systems then in place failed to provide diplomats serving in Libya a level of security sufficient to guarantee their personal safety. The core issue is whether the tragedy was a fluke that only the advantage of hindsight makes visible, or a contingency that reasonably should have been anticipated and prevented by persons in high positions of public responsibility. Although it was first believed that the American deaths resulted from spontaneous mob violence inspired by an anti-Muslim video that circulated on the Internet, follow-up intelligence revealed that the attack was a planned terrorist act carried out by a militia connected to al-Qaeda in the Islamic Maghreb (AQIM), al-Qaeda’s franchise in North Africa. Evolving State Department explanations of the attack’s causes generated a political backlash that became an issue in the 2012 U.S. presidential election. A House Oversight and Government Reform Committee, a State Department Benghazi Accountability Review Board (ARB), and internal audits scheduled by the Department of State Inspector General are delving into the facts surrounding the Benghazi attack. The outcome of these inquiries will probably result in policy changes intended to improve arrangements for protecting U.S. diplomats overseas. 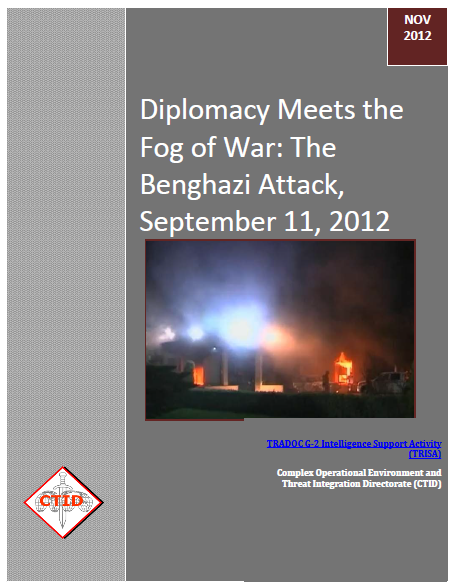 An analysis of facts that have surfaced so far relative to the Benghazi attack should provide insights useful to trainers preparing scenarios anticipating deployments to complex operational environments (OEs). Christopher Stevens, a seasoned professional diplomat, was the Obama Administration’s senior official representative to work with the Libyan revolutionaries during the “Arab Spring.” A Foreign Service officer who had spent most of his career in the Middle East, Stevens formerly served as Deputy Ambassador to the regime of Colonel Muammar Qaddafi. When Stevens arrived in Benghazi in April 2011, the mood among locals could be described as pro-Western, since the Libyan rebels looked favorably on the NATO intervention that was then taking place and which accelerated the process that ended with Qaddafi’s downfall. A year later, in the spring of 2012, Stevens became the first post-Qaddifi ambassador to Libya. Although the ambassadorial office was in the country’s capital of Tripoli, Stevens made periodic visits to a diplomatic mission in Benghazi that was informally called “the consulate.” Security for Americans serving in Libya soon surfaced as a major concern. Former government-sponsored land redistribution programs that dated to the late 1970s fomented widespread discontent that lingered in the wake of Qaddafi’s downfall. Grudges between current occupants of land and ex- property owners found expression in local militias powerful enough to defy government authority. Thanks to the recent prolonged period of revolution, the populace at large was extremely well-armed. Organizations sympathetic to al-Qaeda were known to have infiltrated some of these militias. Faced with periodic lapses in Libyan government authority that resulted in occasional periods of near anarchy, American diplomats in Libya, to include Benghazi, came to rely heavily on contractors to augment security arrangements. One such security contractor was Blue Mountain, a British company that employed local nationals to protect the diplomatic mission in Benghazi. In the months leading up to the 11 September attack, members of the intelligence community on the ground in Benghazi typically met twice a week in the consulate compound to discuss the strengths and weaknesses of its security configuration. The Central Intelligence Agency (CIA) also occupied a compound roughly a half-mile from the Benghazi consulate, and maintained a small quick reaction force (QRF) that could be put in play on an as-needed basis to augment contracted indigenous security personnel. Beyond the recriminations that are almost unavoidable when a national tragedy occurs in the midst of a U.S. presidential campaign, shining a spotlight on systemic blind spots and shortfalls based on what we know to this point may offer some lessons helpful in avoiding a recurrence in the future. One such shortfall is a tendency, if not toward complacency, at least to becoming too comfortable when confronted with post-revolutionary environments wherein newly installed regimes appear to show a friendly disposition toward the United States. Under such circumstances, given the perennial reality of budget constraints, a mindset can easily set in conducive to pursuing an economy of force approach to providing security for Foreign Service professionals assigned to diplomatic posts overseas. This, in turn, creates a tendency to rely heavily on contracted indigenous security forces as a cost saving measure. Clearly, the post-Qaddafi regime in Libya was and still is favorably disposed to U.S. interests. Prior to the Benghazi attack, this positive variable in the equation may have obscured the Libyan government’s very real lack of capacity to adequately fill the political power vacuum that ensued after Qaddafi’s downfall. Where government authority ended, the strength of local militias rose to the fore, and on balance, the environment they created was anything but helpful in building a cohesive security infrastructure in support of a nascent national government. In reality, the patchwork of local militias that emerged created conditions on the ground so chaotic that they sometimes approached a state of anarchy. Prior to the Benghazi incident, these conditions seemed insufficiently sinister to give U.S. diplomats in Libya a sense of being in imminent personal danger. In the absence of a catalyst, surrounded as they were by pro-government militias like the February 17 Brigade and local national contractors hired to protect them, American diplomats on the ground may have considered their circumstances more secure than was actually the case. The advantage of hindsight clearly indicates that the environment which prevailed in Libya in the days leading up to the Benghazi attack lent itself to infiltration by local and non-Libyan threat actors who possessed the capacity and will to manipulate events on the ground according to their skewed terrorist beliefs and agenda. Although lacking sufficient popular appeal to attain power, they remained ready, willing, and able to lock onto any target of opportunity that appeared within their sphere of influence. During the first week of September 2012, one such threat actor was Ansar al-Shariah—a cluster of local militants believed to have links to AQIM.